Earlier this summer KFC Canada took a full day to say thanks to restaurant team members during in-restaurant celebrations. On June 26th, 630 restaurants across Canada participated in National Crew Day, with 52 of those locations also hosting Restaurant Support Center associates, suppliers and franchisees for the festivities. 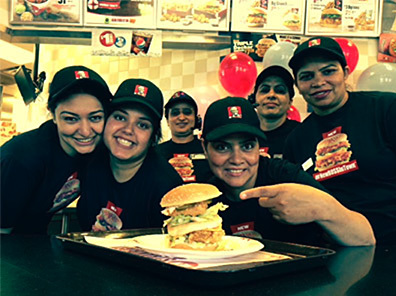 “National Crew Day is a day of recognition for all Restaurant General Managers and team members for everything they do every shift for our valued customers,” said Sheri Bednar, Franchise Operations Specialist, KFC Canada. Activities included distribution of special event t-shirts, recognition of service anniversaries and a special video message from KFC Canada General Manager Nicolas Burquier. Participants also enjoyed some friendly competition to see who could create the perfect Big Boss sandwich.